Entryway mats do more than just cover your floors. They absorb dirt and liquids as people enter and walk through your facility. This process not only keeps your floors clean, it reduces the risk of slip-and-fall injuries and decreases maintenance costs in the long run. Think about all of the money you’re facility spends annually on chemical cleaners, mops, brooms, machines and labor. If you want to protect these investments, you’ve got to think strategically about floor matting. When high traffic areas are left untouched, a square foot of carpet can easily accumulate one-pound of dirt per week (twice that in inclement weather). ISSA estimates that the total cost of finding and removing one-pound of dirt will cost your payroll $600 on average. According to the Institute of Industrial Launderers, 70-80% of dirt and grime is tracked indoors from the feet of individuals entering the building. Without proper matting, the risk of falls and injury are significantly increased. Nearly one-third of workman’s compensation claims related to slip-and-fall injuries – with the average cost exceeding $4,000. Scrapers – These mats are designed to aggressively scrape grime and soil from the bottom of shoes. They belong outside of your facility. Wipers – These mats absorb moisture and soil from the bottom of shoes. They should be placed inside of your facility before walkers reach the actual floor. 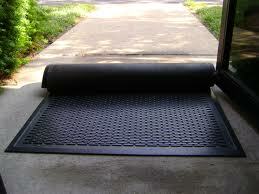 Wiper/Scrapers – These intermediate mats should be placed after a traditional scraper mat, but before a wiper mat (usually within a door entryway). Ergonomic – These mats increase bounce, comfort and support. They’re intended to reduce worker fatigue and are ideal for internal, high traffic areas like hallways. Though it’s a simple concept, matting is a frequently overlooked building cleaning and maintenance strategy. Implementing an effective tactic is a sure-fire way increase your facility’s bottom line. Stay tuned for more cost-saving commercial cleaning and maintenance tips from the National Purity blog.